Thinking of upgrading your bathroom vanities in Tampa? If you want to make your bathroom look stunning without a full remodel, then upgrading your countertops could be exactly what you’re looking for. But what type of countertops should you choose? Granite, marble or quartz which one is best for you? We share all the necessary information to help you select the best countertop for your bathroom vanities. Why Should You Upgrade Your Bathroom Vanities to Quality Countertops? The countertops for your Bathroom vanities always play a double role of needing to be durable and resistant to wear and tear caused by water, soap and cosmetics while providing adequate work space for morning rush hour in the bathroom. This means you should think ahead and ensure you purchase a quality material for your bathroom vanity’s countertop. Choosing the low quality material could result in needing to replace that countertop after only a few short years. Or result in you missing out of the performance and benefits of a high quality countertop material. Just like kitchen countertops, there are variety of countertop materials for a bathroom vanity Most of the materials used in kitchen countertops can also be used as bathroom vanity tops, however, you might not find a top made with wood butcher-block or stainless steel. When you’ll go to shop for a bathroom vanity top, you will have a choice of materials along with a choice of basic configuration styles. So, when you are selecting a vanity top you should consider your budget, taste plus maintenance and compatibility of the material. If you want to maximize the countertop space, then a stone countertop also gives you the option for an undermount sink. For a small bathroom vanity this could make a big difference in the usability of your countertop. Following are three of the most popular bathroom vanity surfaces. Durable, stain-resistant and visually outstanding, granite is a top-notch option for bathroom vanities top. Being the most well know igneous rock, there is no surprise in the fact that it is a very popular material amongst the homeowners. This natural stone is a mixture of multiple minerals, because of which granite comes in a great diversity of colors with visible grains. It is very durable and with proper sealing of the product, it is scratch and heat proof. Granite comes with all the qualities you look for not only a perfect looking bathroom vanity countertop but a long-lasting one as well. Following are some of the advantages of granite which make all its enemies (heat, maintenance and vulnerability) a no-competitor of it. Heat Resistant: If you love to curl and straighten your hair and frequently use tools/ appliances for styling then you don’t have to worry about leaving the appliances on this material as it will not cause it to crack. Granite can successfully resist heat up to 1200 degrees, without any signs of damage. Low Maintenance: If your countertop is properly sealed then a simple soap and water or an everyday organic cleaner is all you need to keep it clean at all times. Durable: As mentioned earlier, as long as necessary precautions are taken for maintenance, granite is, for the most part, scratch and heat proof. Long Lasting: Granite bathroom vanities countertops can be a great investment as they will save you a good amount of money by being an everlasting piece in your home. Click here for more information on granite countertops for bathroom vanities. Quartz is a natural stone famous for bringing beauty to every space. Quartz is one of the strongest countertops available in the market. It is specifically very good for high use areas like a bathroom, where a countertops experience everything from moisture and mildew to various items and appliances that are lifted and placed several times in a day. Following are some of the advantages of this beautiful material. Low Maintenance: You do not require any special kind of toxic cleaners to keep quartz clean, soap and water are just enough to do the trick. Stain Resistant: Quartz countertops do not require sealing which obviously means that they are never needed to be re-sealed. Pores of the countertops are very tight and they do not absorb liquid. It is to be kept in mind that the shine of the quartz can be dulled if it comes in contact with certain kinds of spills including nail polish, drain cleaners etc. Resists moisture: As quartz have very tight pores, bacteria and mold spores are not allowed to be penetrated in the stone. This characteristic of stone is very useful in the bathroom where the countertops are prone to steamy moisture which does not dissipate immediately. You also do not require any heavy duty cleaner and scrubbers to remove these impurities as they can be simply wiped from the surface. Scratch Resistant: If we think about bathrooms, we imagine a place for bathing relaxation and a place to unwind and tend to our needs. But in fact, bathrooms are more like an overwrought place for busy households. No one has the time to worry if hair straightener will cause scratches on the countertop. That is why quartz is a great stone for your bathroom as it is strong and will not receive scratches under normal use. Heat Resistant: This beautiful natural stone is not only resistant to extreme temperatures but it does not require to be sealed as well. Which means there will be no sealant which could get affected by different temperatures. You can also place appliances like curling irons and hot rollers without being worried about discoloration marks. Click here for more information on quartz countertops for bathroom vanities. Appearance: Marble stone provides your home some great visual touches. The swirls and vein of gray on the stone are always pleasing to eyes, receiving all kinds of praise from every new person looking at them! Since you are looking for stone in the bathroom where fewer activities take place that can damage your countertop, you can keep your marble polished like new for years. 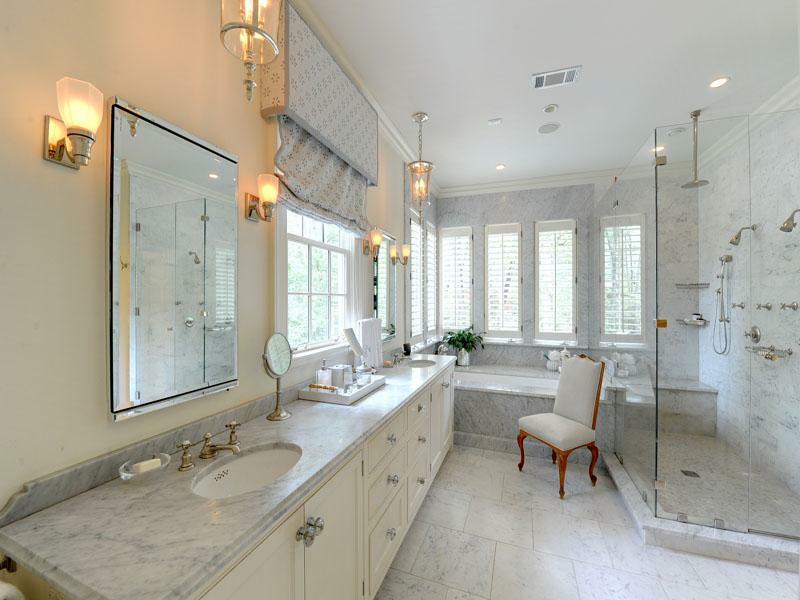 A polished marble stone will add more light to the bathroom. Durability: As compared to many synthetic materials, marble bathroom vanity countertops are more durable. Where some others might melt or burn, marble countertops are capable to take the heat. They are definitely not impervious to heat but still they do very good. Cost: Marble bathroom vanities countertops can actually cost you less than some other countertop materials. You can find them in a wide range of prices, you just need to take your time and find the perfect one for yourself. 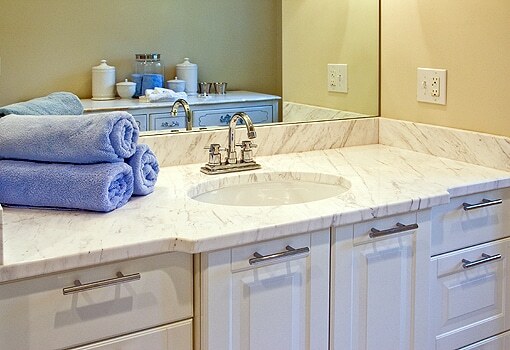 Click here for more information on marble countertops for bathroom vanities. Want to Learn More About Quality Countertops for Your Bathroom Vanities? So, this was everything you need to know about all the popular quality materials before buying new countertops for your bathroom vanities. If you would like to see what these options look like, then visit our showroom in Largo or request a consultation through our website. A countertop expert will contact you back and help you with find out more information. Looking for Vanity Tops for Bathrooms in Tampa Bay? #1 Marble bathroom countertops Tampa Bay – Must See!